Nikki and I’ve been traveling to India to study yoga for almost 5 years now, and there are things about this amazing country that we miss every time we leave. Chai from small stalls along the road, the constant celebrations of life, all the pandemonium on the streets at anytime of the day (cars, bicycles, rikshaws, cows, dogs, cats) all the small moments of indescribable joy as well as surrendering to the experience itself. And of course the FOOD! We do our best to recreate those flavourful dishes when we get back home, yet there is just something very special about a home cooked Indian meal. This sprouted bean salad recipe is one of our all time favourite dishes from Jeevemoksha ashram in Rishikesh, India. It’s colourful, highly nutritious and an amazing source of plant based protein. 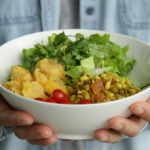 As sprouts are very easy to make we are going to take you step by step and explain how to grow your own so you too can prepare a tasty and healthy dish from scratch. 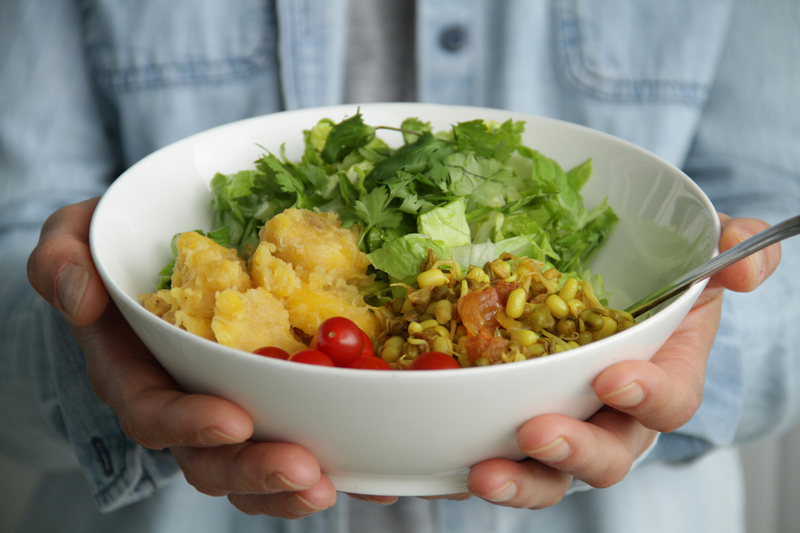 Green Mung Beans are loaded with nutritional health benefits. They are a super rich source of amino acids (for protein), vitamins (A, B, C, D, E and K),and minerals( iron, potassium), and also contain a good amount of fiber. Mung bean sprouts (as well as other types of bean sprouts) are rich in iron, which play a key role in the synthesis of hemoglobin, the protein found in red blood cells. They are also particularly high in vitamin C, which enhances the absorption of iron from the intestine, thereby helping prevent or treat anemia caused by iron deficiency.Mung bean sprouts are an excellent source of lecithin which, besides lowering blood cholesterol levels, helps reduce liver fat . 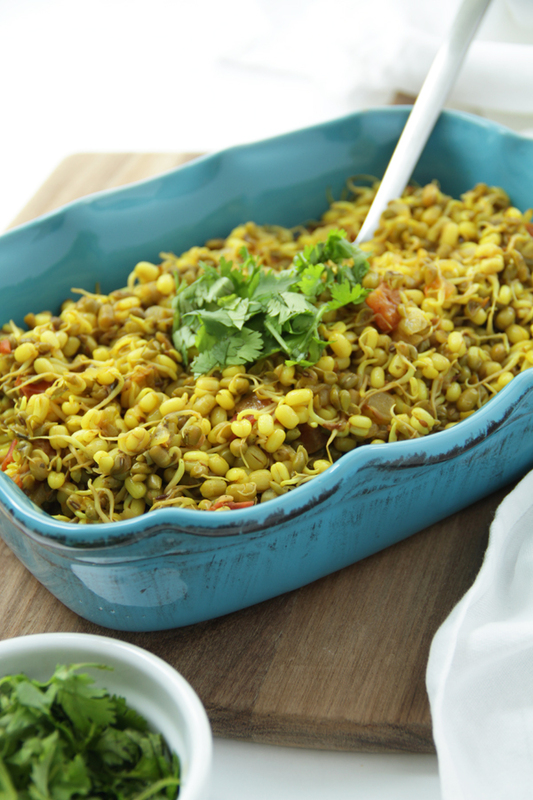 Due to their high content in fiber, mung bean sprouts can help improve intestinal motility and relieve the signs of constipation. In order to make this dish, you need to plan ahead as it requires sprouting the moong beans first. This usually takes around 1-2 days. We usually soak them over night, drain the water and allow them to sprout (1-2 days). Once done, refrigerate them and use within a day or two. 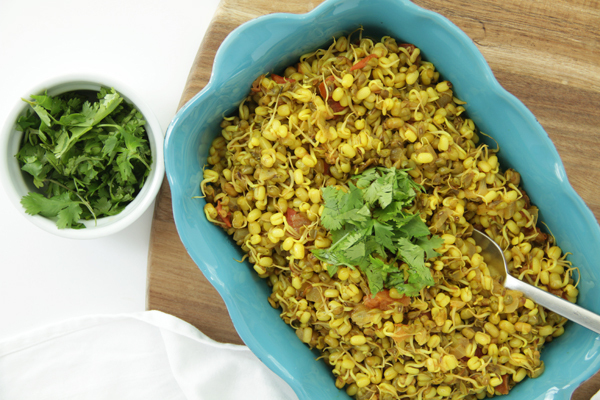 Sprouted Mung Bean Salad is easy, nutrient-dense, and great for a quick lunch! Wash the dry mong beans and soak in enough water overnight or for a minimum of 8 hours. Drain the water, place the beans in a colander and rinse well under running water. Cover and keep in a warm dry place. In the morning you will see the sprouts starting. Again, wash the mung beans, drain the water, cover and keep. Repeat this step for 1-2 days until you see nice sprouts. Cover and keep in refrigerator and use with 1-2 days. Rinse the sprouts well with water. Add the onion and a pinch of salt. Saute until the onions start to turn golden-brown. Add the tomatoes, turmeric, garam masala and cumin powder and cook until the tomato starts to break down but isn't quite mushy. Add the sprouted mung beans and mix well. Cover and let the beans cook over medium-low heat for about 15 minutes. Stir every once in a while and, if needed, add a couple of tablespoons of water to prevent sticking. You can let the beans cook longer if you want them to be softer. Personally we prefer ours a little al dente with some crunch to them. Add salt to taste and the lemon juice. Mix in the fresh cilantro leaves.